The Catholic Church uses her Liturgy — i.e., her religious customs, prayers and ceremonies — to teach us the Mysteries of Faith. Thus, the more we understand the Liturgy, the more we will understand and love our Faith. The Liturgical Catechism was written to describe and explain traditional Catholic Liturgy and practices, as well as to introduce the reader to their profound meanings. "The prayers and functions of the church, far from being meaningless, are rather full of the deepest significance for those who take a true interest in them. A Catholic who desires to live up to his name cannot fail to seek the meaning of all he sees in the public worship of the church, for this meaning adds interest to the prayers, and interest awakens the sentiments of the soul to join actively in the functions and thus praise God." Increasing one's knowledge of sacred Liturgy increases understanding and love of the Faith! Why the Church uses Latin in Her worship. 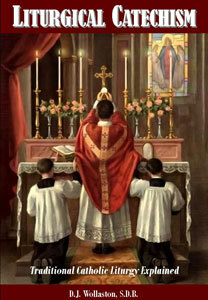 The Tridentine Mass, its various forms and parts. The Divine Office, Benediction, consecration of churches, processions. The ceremonies of the Sacraments. Furnishings and objects in the church. The feasts and liturgical seasons of the Church.